All Puritans, although most strongly the separatists, were unhappy with the insufficient reforms of the English church, as well as with their lives in the Netherlands, those of them that migrated there. 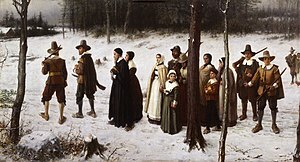 William Bradford opens chapter 4 of hisHistory of Plymouth Plantation 1620 – 1647 with four reasons for the 1621 Puritan migration from Leiden to the Plymouth colony. Briefly, they were: the hard life of work; their advancing age; the work of the children who also were tempted away from the Puritan life; and the conversion of natives. In the new world, they would continue a tight control of theology, banishing those that did not adhere strictly. Thomas Morton founded the Mount Wollaston colony in 1624. The colony name was changed to Merrymount in 1626, and was raided by Myles Standish and disbaned in 1628. 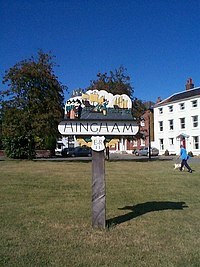 He wrote New English Canaan, published in 1632, which described native society and his ten years of "Knowledge and Experiment of the Country". Roger Williams preached religious toleration, separation of church and state, and a complete break with the Church of England. He was banished in 1635 from the Massachusetts Bay Colony and founded Providence Plantations, which became the Rhode Island Colony. The Rhode Island Colony provided a haven for Anne Hutchinson, tried and banished in 1638 for her Antinomian beliefs. In 1642 she moved to what now is The Bronx. The Hutchinson River Parkway carries her name. Quakers were also expelled from Massachusetts, but they were welcomed in Rhode Island. Years later, four Quakers known as the Boston martyrs remained in Massachusetts and were hanged on the Boston Common in 1659 for practicing their religion. This page was last edited on 24 April 2019, at 17:48 (UTC).